We have dozen's of livestock trailers for sale! Steel and Aluminum, Gooseneck and Bumper Hitch Livestock Trailers for Sale in Illinois. Country Blacksmith features some of the best brands and models from Featherlite, Frontier, Delta and Calico in a wide variety of widths and lengths. From 12' bumper pull to $30,000 Frontier aluminum pen trailers we have the trailer you need! Check out our PEN SYSTEM STOCK COMBO trailer page. We can also order out a custom livestock trailer for you. Call us at 618-242-0800 and let our experience work for you! 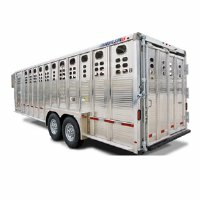 Browse these categories under "Livestock Trailers"
Featured products under "Livestock Trailers"